Our product range includes a wide range of turnkey solutions for solar power projects. Our team will conduct a comprehensive site survey for the proposed project to analyse whether the proposed site is suitable for the Rooftop Project/ Solar Plant Project. 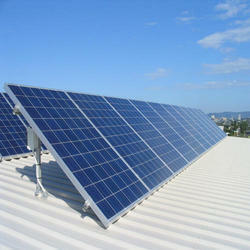 We also help clients find strategic locations for solar power project development. We shall arrange to conduct a project feasibility study for the proposed project and present a feasibility report and financial model. We shall advise and assist you on obtaining project related approvals and clearances. We help in syndication process with Banks, Financial Institutions and Investors to help you find financers for your solar power plants. We help you in understanding the financing structures and corporate structures that are used in the Solar Power Industry. We shall help you take the right steps in project development process in the area of engineering, procurement and construction of the Project. We will help you in choosing the right EPC contractor. Our services include Building/ Ground preparation, construction work and construction management, supply of solar panels, installation, erection and commissioning, power evacuation systems. We help in the entire process from the initiation stage of the project till commissioning of the project until the project is handed over the project owner.